It’s amazing what a small group of dedicated volunteers can accomplish in just one day! 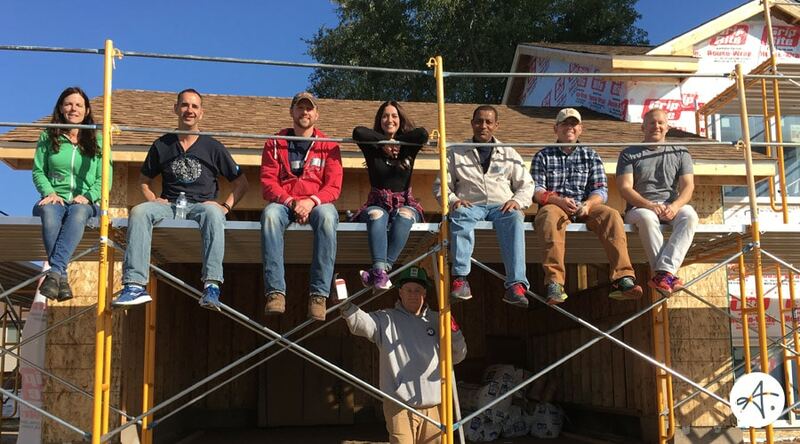 On Friday, October 13th, the Two Or More community of volunteers helped build a Habitat For Humanity home in Blaine, MN. We vapor-sealed the basement floor, moved sheetrock, and wrapped the entire exterior of the home. Some of us got WAY outside our comfort zone: wielding sharp blades, climbing ladders, swinging hammers from scaffolding, and hanging house wrap from the rooftop. What a great experience – pushing us to new heights, quite literally! What made this event all the more meaningful was the fact that we got to work side-by-side with the buyer of the home: a family from Ethiopia who welcomed their fourth child only two weeks ago. Next spring, they will move out from their apartment, and into their new home! What a privilege to be part of the home-building process, and make a life-changing impact. All because local business people – many who didn’t even previously know each other! – took time away from the office to come together around a good cause. We are incredibly grateful for our corporate supporter – Bigfoot Analytics – who made a significant donation to Habitat For Humanity in support of this Two Or More project. Check out our upcoming Two Or More service events here, and register to receive updates and invitations via email.